The First Woman To Appear On A U.S. Postage Stamp Was? Before Trees Towered Over The Earth, What Did? 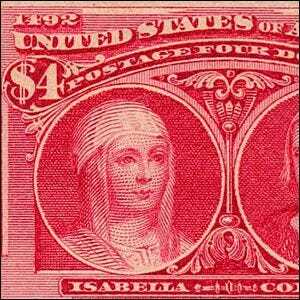 One would assume that the first U.S. postage stamp that bore a woman’s face would bear the face of an American woman. Over the years, there have been many such stamps, like those commemorating Susan B. Anthony (women’s rights advocate), Amelia Earhart (aviator), and Clara Barton (American Red Cross founder). The first U.S. postage stamp with a woman’s face on it, however, wasn’t commemorating a woman specifically, but linking that woman with a man: Christopher Columbus. In 1893, a stamp was issued commemorating Columbus’ voyage to the New World and alongside his portrait was a portrait of his patron—Queen Isabella of Spain, who made his journey possible. It wouldn’t be until 1902 that a woman would be featured by herself on a piece of U.S. postage. That year, the post office released a stamp commemorating Martha Washington, the first “First Lady” of the United States.